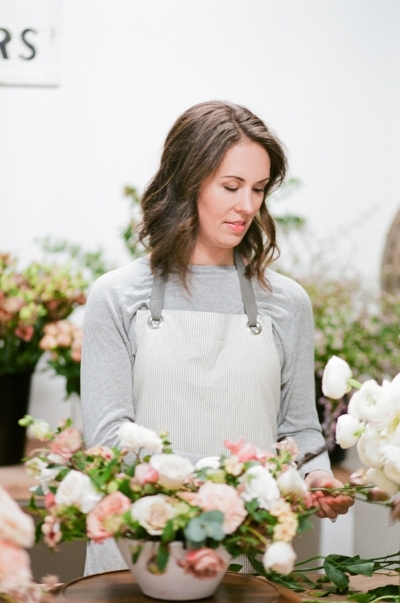 Hi, I'm Bonnie, owner and floral designer at Petal & Posy. I'm a wife to a pretty amazing guy, mom to two sweet and busy little ladies, lover of coffee, wine, girls nights, netflix, and baked goods of all kinds…except pie. Definitely not a fan of pie. Confession: I didn't set out in life to be a floral designer. It wasn't a lifelong dream of mine, or something I always knew I was meant to do. I actually have a degree in Journalism and spent most of my career in marketing and business development. Which clearly has nothing to do with flowers….But here I am. I came to floral design by way of joy and family. My sister asked me to do the flowers for her wedding in 2015 and of course I said yes. Although I had no training and no idea what I was doing, I found myself so at peace and overcome with JOY while creating for her. Like the full body goosebumps, can’t stop smiling kind of joy. It was during the creative process for my sister's wedding that this passion to work with flowers was awakened. After a few other small events for friends and family, I was convinced that my calling had been found. A year and a half later, after a lot of thought, prayer and with much excitement, I formally launched Petal & Posy. I am so thankful to have a career that is creative and allows me to bring joy to the lives of others. I look forward to sharing my passion for flowers with you.